John, Paul, George, Ringo and ADOLF! : 1976’s “All This and World War Two” – LILY & GENEROSO 4EVER! Helming this mess would be first time director, Susan Winslow, who had just worked as a researcher on the 1975 Phillip Mora documentary, “Brother Can You Spare a Dime,” which also blended newsreel footage and film clips in a nostalgic and satirical way, that time about the great depression. I guess that subject wasn’t dour enough for film audiences, so let’s turn to everyone’s favorite war for some smiles and a gentile poke in the ribs. 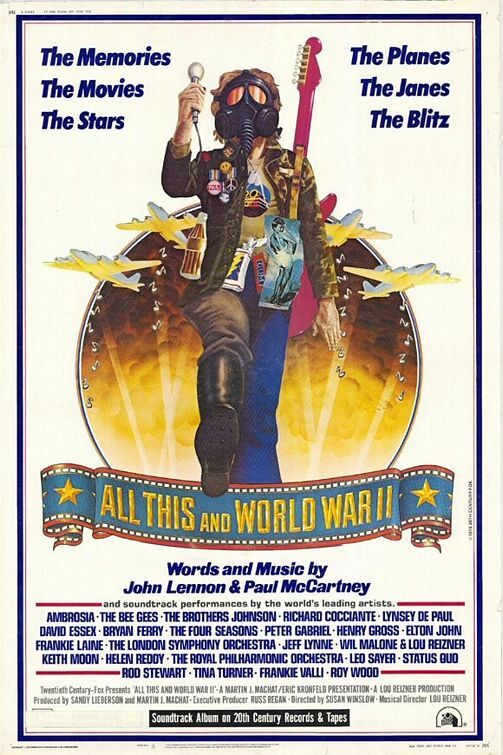 The film opens with Germany preparing for war, manufacturing munitions and mounting Panzer tanks as the smooth rock sounds of Southern California’s Ambrosia performs “Magical Mystery Tour” in the background. At one key point, “Load up for the mystery tour” is sung while solider loads his rifle…yikes. Though this sounds like a bad idea, and it is, it pales in comparison to the musical/visual matchups that later follow in this film. I would suppose that the overarching peace sentiment of the film was due to our withdrawal from Vietnam a year earlier in 1975, but there are just too many scenes coupled together that I feel are supposed to make you get a tad happy about our involvement in the big show. For example, I assume Hitler is played off as a bad guy here as “Fool on the Hill” is added during newsreel footage of Adolf gazing out from his mountain home above Berchtesgaden, but why is “Maxwell’s Silver Hammer” being played as Americans line up at the recruitment office? There are a lot of contradictory moments in this film that seem to come out of a need to play some of the songs that had been recorded as opposed to writing songs based on the footage that was to be used. By the time you get to Elton John performing “Lucy In The Sky With Diamonds,” while allied planes get ready to bomb Germany, you know that we are not dealing with surrealism here but a truly deranged mess of a movie that has no central idea. If the horrors of war were to be contrasted against genuine human suffering for the sake of comedic irony, then why aren’t we seeing actual human suffering in the film? With the notable exception of Japanese Americans being taken to internment camps (with The Brothers Johnson performing “Hey Jude” in the background? ), you never actually see a person in peril or pain, so what you are left with is a bunch of fair to poor Beatles covers and a poor excuse for an anti-war work of art that does not even have the courage to make the audience endure true suffering to complete the satire.